An accomplished athlete, Payton Morgan has proven consistently for four years that he is dedicated to the Trojan football team. Morgan played football in middle school and developed a passion for the game. He decided to continue playing football in high school. He has been playing football for the Trojans since his freshman year. Morgan says that since then so much of his life has revolved around football. For four years he has dedicated countless hours to becoming a better player. For four summers he has woken up early in the morning nearly every day to dedicate his time to going to practice. For four springs and winters he and his teammates spent hours every week at the gym lifting weights for the next season. These years that Morgan has spent alongside his teammates have brought them all closer, he said, and that he would do anything for them and the team. “He’s got great grades. He tutors me in prob and stats. He’s a really good kicker. He wasn’t starting during the first half of the season. Once coach started putting him in he started shining and doing really well and scoring a bunch of touchdowns,” Morgan’s teammate and fellow kicker Jake Harris said. At this point in his final year of high school football he has had two field goals and four touchdowns as running back and kicker. He also succeeded on 11 out of 12 on points after touchdowns. 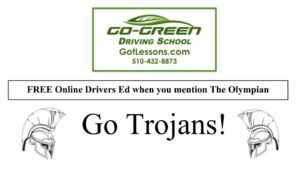 During the Homecoming game against the Encinal Jets, Morgan scored the first touchdown for the Trojans and a field goal shortly after. In the last Homecoming game of his life Morgan and his teammates fought until their last breaths. After losing this game Morgan was visibly distraught. One could see that he truly cared about the result of this game and that he gave it everything he had. “All I hope for our team is that we play every game like its our last because it’s the last chance a lot of us will ever get to play football,” Morgan said. His passion for the sport, his school, and his team has inspired those around him and his tenacity led his teammates by example.